We’d love your help. Let us know what’s wrong with this preview of The Scribe's Daughter by Stephanie Churchill. Kassia is a thief and a soon-to-be oath breaker. Armed with only a reckless wit and sheer bravado, seventeen-year-old Kassia barely scrapes out a life with her older sister in a back-alley of the market district of the Imperial city of Corium. When a stranger shows up at her market stall, offering her work for which she is utterly unqualified, Kassia cautiously takes him o Kassia is a thief and a soon-to-be oath breaker. Armed with only a reckless wit and sheer bravado, seventeen-year-old Kassia barely scrapes out a life with her older sister in a back-alley of the market district of the Imperial city of Corium. When a stranger shows up at her market stall, offering her work for which she is utterly unqualified, Kassia cautiously takes him on. Very soon however, she finds herself embroiled in a mystery involving a usurped foreign throne and a vengeful nobleman. Most intriguing of all, she discovers a connection with the disappearance of her father three years prior. To ask other readers questions about The Scribe's Daughter, please sign up. 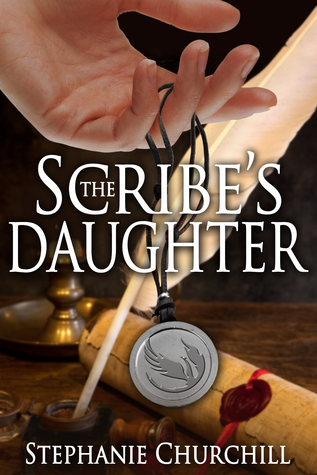 The Scribe’s Daughter is an exciting, action-packed adventure story set in a fictional imagined world. Although not specified, the time period has the feel of the medieval and I imagined the story taking place somewhere in the countries around the Mediterranean. Kassia is a sparky, feisty heroine. She’s a tomboy when we first meet her; brave, if a little reckless. Kassia has need to be brave, though, because her father disappeared three years ago after failing to return from a trip, and she has t The Scribe’s Daughter is an exciting, action-packed adventure story set in a fictional imagined world. Although not specified, the time period has the feel of the medieval and I imagined the story taking place somewhere in the countries around the Mediterranean. Kassia is a sparky, feisty heroine. She’s a tomboy when we first meet her; brave, if a little reckless. Kassia has need to be brave, though, because her father disappeared three years ago after failing to return from a trip, and she has to look after her sister, Irisa, and somehow find a way for them to survive. Although suspicious of the stranger who turns up offering her handsome payment in return for repairing a piece of jewellery, Kassia decides it’s better than the undesirable alternatives on offer. This decision will have consequences for both Kassia and her sister. Carrying out the task takes Kassia out of the city of Corium and it soon becomes apparent that someone is out to get her (for unknown reasons) but that others are out to protect her (for equally unknown reasons). A story that has started out fairly light suddenly gets darker as we see that Kassia is not immune from the dangers facing a woman travelling alone. I did find this part of the book surprisingly unsettling. Kassia’s experiences will scar her physically and emotionally, making her unwilling to trust anyone and leaving her seeing herself as damaged and unworthy of anyone’s love. Many adventures and strange new places await Kassia and the group of fellow travellers she falls in with. She learns surprising things about her past that cast her in a new and unwelcome role. Can she be more than a pawn in a political game or a chattel to be negotiated over and possessed? Will she eventually be able to trust someone with her heart? The author skilfully brings Kassia’s story to a satisfying conclusion but leaves strands to be picked up and woven into a new story in The King’s Daughter. Being an indie author myself, I enjoy reading novels by other brave souls who decide to self-publish. It's tough to be responsible for a book from cover to cover, and I tend to be more forgiving when reviewing an indie novel because I sympathize with the challenges faced. This is the attitude I held when I picked up The Scribe's Daughter, but this novel demands that it be held to a higher standard. Nothing about this book made me think, "It's good for an indie novel." This book is just a joy to r Being an indie author myself, I enjoy reading novels by other brave souls who decide to self-publish. It's tough to be responsible for a book from cover to cover, and I tend to be more forgiving when reviewing an indie novel because I sympathize with the challenges faced. This is the attitude I held when I picked up The Scribe's Daughter, but this novel demands that it be held to a higher standard. Nothing about this book made me think, "It's good for an indie novel." This book is just a joy to read and can hold it's own against any competition, traditional or self-published. It is beautifully written, edited, and formatted with an intriguing storyline and captivating characters. Stephanie Churchill has vividly created a world that will feel familiar to those who enjoy medieval historical fiction. As the protagonist, Kassia, experiences adventures that take her on the full range of fortune's wheel, each setting is beautifully described. I had a clear vision of mountain vistas, sparkling lakes, bustling cities, and thick forests, and felt as though I was there at Kassia's side. Each character that shares Kassia's trials is given a unique and complex personality, but none more so than Kassia herself. Since the novel is told from a first person point of view, the reader is inside Kassia's head. We get to laugh out loud at her snarky sarcasm while we are sharing her inner pain and doubt. This strong, courageous young woman goes through more to get to her happily ever after than anyone in the story, besides the reader, is privy to. I'm a fan of the fantasy genre and picky about my books. This is a very well written book with several interesting plot twists and surprises. The characters are well drawn, and the heroine is especially entertaining with her sarcastic sense of humor and plucky spirit. The secondary characters are also interesting. The pacing is, perhaps, a bit uneven (not surprising for a debut novel), but while the book may start a bit slowly, it certainly makes up for it the rest of the way! For fans of YA or f I'm a fan of the fantasy genre and picky about my books. This is a very well written book with several interesting plot twists and surprises. The characters are well drawn, and the heroine is especially entertaining with her sarcastic sense of humor and plucky spirit. The secondary characters are also interesting. The pacing is, perhaps, a bit uneven (not surprising for a debut novel), but while the book may start a bit slowly, it certainly makes up for it the rest of the way! This book is hands down the best medieval fantasy novel I’ve read in years. I started The Scribe’s Daughter not sure what to expect. Realistic, contemporary fiction is usually my go-to genre, so I wasn’t sure I would click with this book. The very first chapter proved me wrong though. I was immediately sucked into this alternate world and incredibly intrigued by the mystery that was slowly unfolding. I won’t include spoilers (because I hate it when reviews do that) but I will say that there were This book is hands down the best medieval fantasy novel I’ve read in years. I won’t include spoilers (because I hate it when reviews do that) but I will say that there were more than a few twists and turns that I never saw coming. I will also say that I felt an extremely strong connection with Kassia (the MC). She’s exactly the type of character I love—gutsy, whip smart, and totally unconventional. She’s also enormously complex and came off as a real person with real, complex problems and feelings. I loved that Kassia’s story was always layered and never fixed with a simple solution. To me, this is the hallmark of truly excellent writing. All in all, The Scribe’s Daughter felt like a deliciously addictive mix of Margaret Atwood and J.R.R. Tolkien. I highly recommend it to anyone who likes fantasy literature of any sort. This book was sent to me months ago, before Christmas, 2015, a signed and inscribed copy sent to me by the author, a woman with whom I was a co administrator on the FB fan page for Sharon Kay Penman. It sat on my desk for a few more months, growing roots next to the other books that were on my “to read” list. I knew she was writing this book, and read an early chapter long ago. I am not a fan of books written in the first person, regardless of who the author is, and will not read them if I have This book was sent to me months ago, before Christmas, 2015, a signed and inscribed copy sent to me by the author, a woman with whom I was a co administrator on the FB fan page for Sharon Kay Penman. It sat on my desk for a few more months, growing roots next to the other books that were on my “to read” list. I knew she was writing this book, and read an early chapter long ago. I am not a fan of books written in the first person, regardless of who the author is, and will not read them if I have a choice, and if I don’t, then I read them unwillingly. I mentioned this one day to Stephanie, before I knew this book was written in the first person. Insert foot, close mouth. She sent it to me anyway, and I clearly had set the stage for blisteringly honest book evaluations. So, I packed this book in my carry-on luggage for my week visit home over the Christmas holiday. I just could no longer ignore it, sitting as it was on top of the books piled expectantly on my desk. On the return plane trip back to Boston, I opened the book. And there I was, almost instantly, in this magical place that has never existed, and yet has existed forever. This book is a gentle, lyrical dance of seven veils….veils that ultimately fool you, showing you a world and characters in a gauzy, distant way, with ordinary lives that by the end of the book bear little to no resemblance to the world and the characters standing on the last page. It was slow in coming, the clarity, as I kept turning the pages. Each veil is torn away unexpectedly, in an instant: a page, a paragraph, a sentence, and sometimes, with a single word, none of which I saw until it was too late for my emotions. After the last veil was torn away, the last vestige of the patina of any normalcy in the world in which we were standing scraped away, then, just then did I realize how utterly skillfully this book sucked me in, fooled me, tricked me, and made me slow the page turning because I did not want it to end. When it did, it took me a few days to shake off the mix of emotions. I missed these characters. I loved the writing. I had nothing but wonderment at the skill required to create those veils and strip them away at exactly the right moment. One day, I will be able to say I knew her when….as I stand in line at a book signing for her to sign my copy of her fifth book, just another fan of thousands. Set in a land that in my mind bears some resemblance to Renaissance Europe, young Kassia and her sister survive in the city thanks to their skills (and Kassia's light fingers and wit), after the death of their mother and disappearance of their father (presumed dead on a trip). Although Kassia is the younger of the two, she's the one taking care of the both of them, wiser to the ways of the world than her sister, and not afraid to get her hands dirty to ensure their survival. But one day their li Set in a land that in my mind bears some resemblance to Renaissance Europe, young Kassia and her sister survive in the city thanks to their skills (and Kassia's light fingers and wit), after the death of their mother and disappearance of their father (presumed dead on a trip). Although Kassia is the younger of the two, she's the one taking care of the both of them, wiser to the ways of the world than her sister, and not afraid to get her hands dirty to ensure their survival. But one day their life changes when she gets entrusted with a mysterious job that will change their lives forever. Not saying anymore about it to avoid spoilers, but damn was this an entertaining and enthralling read! Couldn't put it down, and led to a couple of sleepless nights! Kassia is a very lively protagonist, with some very fixed ideas about the world (so fixed that sometimes you want to hit her on her head a bit to jar her out of it), and with very good survival instincts. The Scribe's Daughter by author, Stephanie Churchill is an exciting tale from the first page to the last. As I read the book I felt like it was a historical fiction body of work with some fantasy added in, The Scribe's Daughter has something for fans of either genre. Kassia, the main character is a strong willed, self reliant young lady that is quick with a sarcastic quip. Kassia is so well written that the reader is swept along with Kassia upon her journey of self discovery. Through trials and The Scribe's Daughter by author, Stephanie Churchill is an exciting tale from the first page to the last. As I read the book I felt like it was a historical fiction body of work with some fantasy added in, The Scribe's Daughter has something for fans of either genre. Kassia, the main character is a strong willed, self reliant young lady that is quick with a sarcastic quip. Kassia is so well written that the reader is swept along with Kassia upon her journey of self discovery. Through trials and tribulations Kassia comes out the stronger for these happenings and with the author having a flair for drawing in the reader to sympathize and root for Kassia to overcome all of the obstacles thrown her way. With a wide variety of secondary characters and a well thought out story line the author tells a tale with many plot twists and turns. I enjoyed being kept guessing on what was going to happen next and how Kassia's journey would end. With The Scribe's Daughter, Stephanie Churchill gives us the foundations for a compelling fantasy series, with a sassy, engaging heroine. The book is written in first person, from the perspective of young Kassia, who becomes embroiled in all manner of political intrigues, fights and flights from pursuits, as the novel progresses. There is a lot of action with Kassia's backstory slowly revealed as the plot unfolds. The world that Churchill has built is believable and interesting, though I have to With The Scribe's Daughter, Stephanie Churchill gives us the foundations for a compelling fantasy series, with a sassy, engaging heroine. The book is written in first person, from the perspective of young Kassia, who becomes embroiled in all manner of political intrigues, fights and flights from pursuits, as the novel progresses. There is a lot of action with Kassia's backstory slowly revealed as the plot unfolds. The world that Churchill has built is believable and interesting, though I have to admit, I don't really understand the creation of a different world where nothing is substantially different from a pseudo-medieval Europe. If there is no magic or dragons or something else that doesn't exist on Earth, why not set it in the real world at some interesting point in history? This felt at times like historical fiction masquerading as fantasy, or perhaps vice versa. Having said that, the setting did not detract from the story or my enjoyment of the book, and Churchill has created a rich world, with a real sense of realism. The plot trips along at a fair old pace, with Kassia being confronted with one obstacle after another. Churchill's writing is excellent, with many an elegant turn of phrase. The writing seemed to get more assured and the characters stronger in definition as the book progressed, but speaking from my own experience of writing, I think that is often the case with debut novels. I greatly enjoyed this fantastical yarn of adventure, politics, and love. I especially enjoyed the protagonist's sense of humour, an element far too often lacking in historical novels. I did find, however, the humour was uneven, sputtering out as the novel went on. One other drawback was the epilogue. It quite discombobulated me. Overall, a recommended read. Let me get the positive out of the way first. Churchill can write. She writes beautifully and has a way with words. Writing beautifully, smoothly, does not an "author" make. I do not enjoy panning a writer because I know the pain of writing. I do, however, want to make positive suggestions. Every page of this story has only one major character -- Kassia. This is the problem with 'first person' narrative. One has to learn to take the 'me' out of it. That's more difficult than it sounds. First pers Let me get the positive out of the way first. Churchill can write. She writes beautifully and has a way with words. Writing beautifully, smoothly, does not an "author" make. I do not enjoy panning a writer because I know the pain of writing. I do, however, want to make positive suggestions. Every page of this story has only one major character -- Kassia. This is the problem with 'first person' narrative. One has to learn to take the 'me' out of it. That's more difficult than it sounds. First person narrative also struggles constantly with the need to 'tell' the story. It is, consequently, light on dialogue and allowing the story to happen. A story involves a cast of characters, more than one. While Churchill offers us embryonic characters, they never quite reach full growth, never have their own lives except to show up when Kassia has need of them. They're at hand. This story cries for complete characters to deepen the tale. Churchill created possibilities she never plumbed. You have a world of kingdoms and you never get a solid feel for any of them. You get unconnected fragments. Her foreshadowing was clumsy and created no surprises. Kassia had wisdom but she never used it. She made the same mistake over and over and over and over and over and over again. I wrote that sentence on purpose because that is how aggravatingly irritating Kassia's lack of thoughtfulness was. My suspicion is that Churchill thought she was creating a strong-willed woman. She did not learn from her experiences and she did not grow. She equivocate right through to the end. A whole book of 'I' from Kassia. and then, the Epilogue, and the 'I' continues, confusing, because you suddenly realize the 'I' is not Kassia but her sister, Irisa, who was nonexistent except by mention from time to time, in the book. In such a case, Irisa desperately needed her own personality and she did not have it. Churchill needs to learn to write in third person and needs to learn how to construct a real story; to create lives for all her characters; to create histories for all her kingdoms. I found it impossible to accept that she could not write Irisa in third person. Her first person narrative is glib, but that does not make it clever, profound, or enlightening. She professes admiration for Sharon Kay Penman, an extraordinarily excellent author who is one of my personal favorites. Yet it's wondrous because it appears that Churchill did not pay attention to how Penman wrote her stories and made them live. It is not enough to receive good vibes and 'atta girls' from family and friends. Real editors, good editors, are the one who help authors, particularly new authors, to perfect their work. Writing also needs delicacy of hand at certain moments and any author needs a thick skin to combat the reviews. Paula Lofting Gosh i'd hate to see a review by you of someone's book who couldn't write. I don't understand how you have the temerity to actually tell a person how Gosh i'd hate to see a review by you of someone's book who couldn't write. I don't understand how you have the temerity to actually tell a person how she should have written her own book in a review. The Scribe's Daughter is essentially a fantasy book, though without any of the magical trappings that you might normally associate with fantasy. The world is broadly medieval in feel, with edged and missile weapons in regular use, but no gunpowder or anything more destructive. Kings and nobles rule the diverse cities and countries of this land, which feels rather like Europe or North America without ever making explicit parallels with those continents. The plot develops not by way of battles or m The Scribe's Daughter is essentially a fantasy book, though without any of the magical trappings that you might normally associate with fantasy. The world is broadly medieval in feel, with edged and missile weapons in regular use, but no gunpowder or anything more destructive. Kings and nobles rule the diverse cities and countries of this land, which feels rather like Europe or North America without ever making explicit parallels with those continents. The plot develops not by way of battles or magical quests, but by way of the personal development of the central character, Kassia. She suffers deprivation, hardship, and abuse as she tries to find out who she is, and why various factions are vying over her whereabouts and wellbeing. The political world into which she is unwittingly propelled is alien to her, and deeply uncomfortable. The unfolding storyline tells of Kassia's resolute efforts to choose her own future and lifestyle, despite the machinations of others. I started listening to The Scribe's Daughter on Audible, but by about 1/3 of the way through gave that up and switched to reading on Kindle. The narration on Audible seemed good at any stage, but did not hold my attention. I found myself all too easily losing the thread of the plot, and hence becoming baffled as to why things were happening, and to whom. Reading the written word proven to be a much more satisfying experience for me, and one which made far more coherent sense of the book. No doubt some other people would have the opposite experience. The whole process, triggering such different reactions to the two versions of the same book, was very educative, and gave me cause to think about what kinds of books suit which medium. For me, this was definitely a 5* book, primarily because of the world-building and the focus on inter-personal action rather than battles of any kind... probably some people would become impatient with it for exactly the same reasons. I am immensely glad I switched to reading rather than listening, and so persevered. The twists and turns of the plot, and the collection of environments and characters that Kassia and her party encounter, were consistently fascinating and well-drawn. My only minor niggle is that I would have appreciated a map - the whole journey presupposes one as a guide to the journeys, and it would have helped me to visualise progress. I really didn't much like this story... The story is told from our protagonist's (Kassia) POV... and I was just never quite able to lose myself in the story. I blame the author for that. Some stories invite the reader into the world created, and some, like this one, forgot to send the invitation... The beginning was intriguing enough that I decided to finish listening, but toward the end it was a near thing... I was really questioning my decision to "tough it out"
One of my triggers is having the I really didn't much like this story... The story is told from our protagonist's (Kassia) POV... and I was just never quite able to lose myself in the story. I blame the author for that. Some stories invite the reader into the world created, and some, like this one, forgot to send the invitation... The beginning was intriguing enough that I decided to finish listening, but toward the end it was a near thing... I was really questioning my decision to "tough it out"
The Scribe's Daughter was over all an alright book and I could have marked it down as a slightly badly written novel that had an okay story and characters. Until.... I got to the end of chapter 12. Early on in the novel, Kassia is brutally raped by prison guards. She deals with all the pain and trauma such an evil act brings with it... Eventually finding out that she is pregnant. I disagreed with her apparent hatred for the life inside her but I could see where you could feel as Kassia did. By chapter 12, Kassia experiences a miscarriage and the baby dies. This is what she says in response to the innocent's death. judge for yourself. "The seed of my abuse had been expelled, and I was free. My future was not my own any longer, but I was free of my shame and could put the past and its defilement as far away from me as my innocence." The Scribe's Daughter is listed as a fantasy, but not the type of fairies and dragons. It reads like historical fiction, but the lands and their people are the creation of the author. This book tells the story of 17-year old Kassia, whose mother has died and whose father has been missing for some 3 years. Kassia and her older sister are doing what they can to survive and to keep the terrifying landlord from the door, so when a stranger appears and asks Kassia to take on some metalwork, she agrees The Scribe's Daughter is listed as a fantasy, but not the type of fairies and dragons. It reads like historical fiction, but the lands and their people are the creation of the author. Stephanie Churchill has a solid future as an author, especially with her skill at imaginative scene settings. I would have liked the dialog to have seemed more fitting to the "time" and the ending a bit less abrupt, but she does give the reader a feeling of continuation through a short glimpse of what's to come. A fine debut, somewhat in the style of Stephen Lawhead, I recommend it for older teens - adults. I found this book to be very hard to put down after I started reading it. It was very well written and the description was great, you could almost see what the author was writing. I usually don't read this kind of book but it made me keep reading because I couldn't wait to see what was going to happen next. I really enjoyed this first reads book . Loved the strong female lead character. Would definitely read more by this author. Wish her great things in the future. My first thought after finishing The Scribe's Daughter was 'Wow!' It is hard to believe this is a debut novel. It is so polished and intelligently written, having none of the naivety that can be found in, even, the best debut novels. I found myself picking up the book at any opportunity - every spare five minutes were spent in the world Stephanie Churchill has created. I was often reading late into the night, just to devour that little bit more of the story. The author draws you into her world, My first thought after finishing The Scribe's Daughter was 'Wow!' It is hard to believe this is a debut novel. It is so polished and intelligently written, having none of the naivety that can be found in, even, the best debut novels. I found myself picking up the book at any opportunity - every spare five minutes were spent in the world Stephanie Churchill has created. I was often reading late into the night, just to devour that little bit more of the story. The author draws you into her world, building cities, towns, palaces and swamps from her imagination and setting them down in a medieval atmosphere from which it is impossible for the reader to escape. The language, descriptive expertise, attention to detail and wonderful use of imagery helps to create a world that surrounds and embraces the reader. From a strange town, with stranger customs, in the middle of a swamp, to a dismal prison or a fairy tale palace, Stephanie Churchill weaves a world and stroyline that is, at once, colourful, vivid and full of a sense of mystery. The story opens with a gripping chase through a medieval city, taking the breath from the reader and continues at much the same pace to the very last word. The plot line is well-defined, and cleverly reveals itself as the story unfolds. With sadness and humour interwoven into the story, the author subtly creates a realism that is deeply embedded into every aspect of the story. The Scribe's Daughter is built around the heroine, Kassia; a unique individual; a 17-year-old orphan trying to create a better life for herself and her sister, who is drawn into a world she knows little of and a secret she wasn't even aware existed. Kassia is brave, witty and often brash and hot-headed - you can't help but love her. The author has thought hard over the experiences - and experience - of her heroine, knowing that a teenager may have some skills, but still has a lot to learn. For example, living in a city, Kassia has never ridden a horse so, of course, she suffers from sore thighs and falls off the first time. Such little details make this a delightful story, leaving the reader sympathetic to the heroine and desperate for her to win through. All the subsidiary characters in the book are just as well thought out and interesting as the heroine herself. The love interest is provided by Jack; a helpful young man who has secrets of his own, is drawn to Kassia, but love never runs smoothly, especially in books! The villains are suitably vicious, colourful, subtle and devious - shadowy figures who may know the secrets Kassia has yet to discover. This was quite a difficult review to write because technically this is a good book with a strong plot that also lays the foundations for subsequent ones in the series, it has a wide variety of interesting characters, but it just didn't grab me as there was something about the pacing where it just seemed to meander on without really picking up even during the major plot points. The narrator did a good job overall with a suitable arrange of tones for the various characters, but the overall delivery This was quite a difficult review to write because technically this is a good book with a strong plot that also lays the foundations for subsequent ones in the series, it has a wide variety of interesting characters, but it just didn't grab me as there was something about the pacing where it just seemed to meander on without really picking up even during the major plot points. The narrator did a good job overall with a suitable arrange of tones for the various characters, but the overall delivery probably didn't enhance the audiobook as much as it could have done. Overall, objectively speaking this was a good book, but just wasn't for me. I was pleasantly surprised by this one - first I was expecting straight medieval rather than fantasy, perhaps because I found Stephanie and followed her progress via Sharon K. Penman. It took me a while to get round to reading, but once I did, I couldn't put it down. Aside from one plot element that felt like it was too much and was overly stereotypical of how women's adventures end up sooner or later, the tale was gripping and consistent, the characters well-rounded and believable. I look forwar I was pleasantly surprised by this one - first I was expecting straight medieval rather than fantasy, perhaps because I found Stephanie and followed her progress via Sharon K. Penman. It took me a while to get round to reading, but once I did, I couldn't put it down. I saw this book recommended by a Goodreads Author, one of my faves, so of course HAD to give it a shot. Was SOOOOO worth it. A well told tale of self-discovery that had me pondering from page to page how each new conflict would work itself out... and it did, knotty problem by knotty problem. Already have my mouth watering for the next in the series, and downloaded it upon finishing this one. This is why I friend Goodreads authors... if they like someone else's work, and I like theirs... chances a I saw this book recommended by a Goodreads Author, one of my faves, so of course HAD to give it a shot. Was SOOOOO worth it. A well told tale of self-discovery that had me pondering from page to page how each new conflict would work itself out... and it did, knotty problem by knotty problem. Whoops! Finished this one a while ago, but didn't put up a review right away, and now it's starting to fade. Overall, a decent book. Well edited, though certainly slower than it needed to be. I was also hoping it would have more of a historical fiction feel to it, but it was more about the characters than the setting. I was immediately captivated after reading the first paragraph. I knew this author offered much detail by the way she used her words to evoke memory and visions of the current events that she so easily described. I truly enjoyed reading Ms. Churchill's book, "The Scribe's Daughter." The Scribe's Daughter by Stephanie Churchill has received a Chill with a Book Readers' Award. "Beautifully written with lots of surprises." It caught me, loved the story. The authoress creates her own world and is an enthralling one and she is being gracious to let me know that the second book the kings daughter will be out in the fall this year! so I can keep reading about this sisters story. I was really cheering for Kassia! Robustly written backgrounds, sympathetic protagonist, and a lovely broad sweep of political shenanigans; off to look for the sequel.